Need to go real long without spending a fortune? 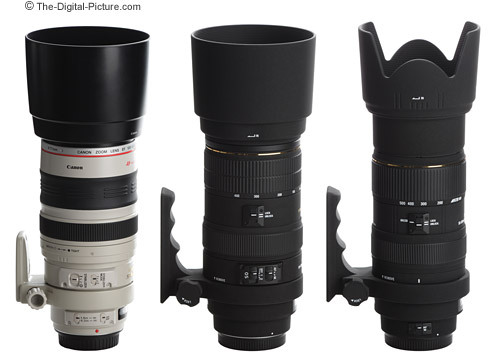 The Sigma 80-400mm f/4.5-5.6 EX DG OS Lens is a lens that fits this requirement. 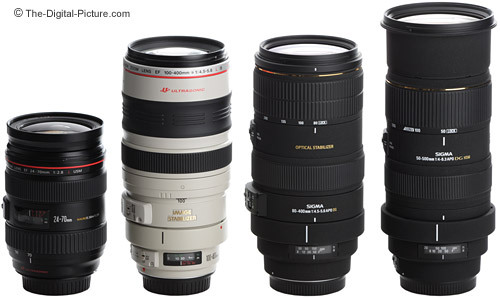 Need a wide range of focal lengths available for instant use? This lens can meet this need as well. Bearing Sigma's EX designation, the Sigma 80-400mm f/4.5-5.6 EX DG OS Lens makes the grade for build quality. It is solid - even when fully extended. Of course, with a lens of this size, weight comes along with the solid build - 3.6 lb (1.650 kg). Measuring 3.7" x 7.5" (95 mm x 192 mm) retracted, this lens feels large as well - especially the diameter. 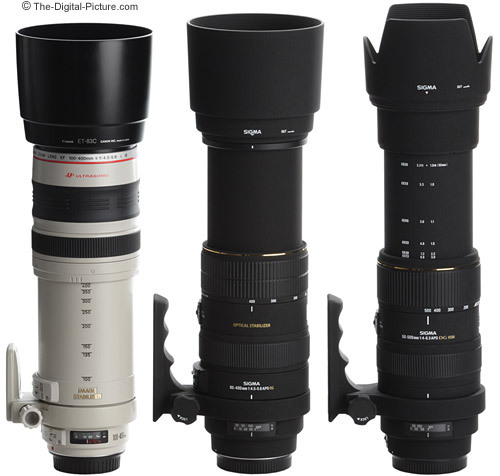 And it gets bigger - Zooming to 400mm extends the lens by 3.4" (86.4mm) to 10.9" (276.9mm). Overall, the design is very nice with smooth transitions between barrel and rings. The finish is the standard Sigma stealthy matte black EX finish. Fortunately, OS (Optical Stabilization) comes to the aid of handholding this large, heavy lens. The Sigma 80-400 OS user manual advertises 2-stops of increased handholdability when using OS - and this is close to what I am seeing. I can handhold this lens on a full-frame body at 400mm without OS and seem to hit an acceptable sharpness wall at 1/125 with OS active. This is a very valuable feature to me - It makes this lens much more useful to me. The Sigma 80-400's OS is well-behaved (doesn't jump around much), but often causes a strange mirror/shutter behavior. Even for a fast exposure, the mirror is locked up for much longer than necessary for the shutter to do its thing. The sound is a disconcerting click-click instead of a normal click. Turning off OS returns normal mirror behavior, not all OS shots exhibit this abnormal behavior. One switch is provided for OS settings - off, Mode 1 and Mode 2 (for panning). Since the switch has a very short throw, getting the middle Mode 1 position requires some care. This OS implementation is not tripod sensitive - Using OS with the lens mounted on a tripod can result in erratic performance. The balance of the available switches (shown above) on the 80-400 are for AF/MF and zoom lock. Zoom lock prevents the lens from gravity zooming while pointed down. My lens does not need this - at least not yet - as the zoom ring is very firm. The zoom ring is firm and smooth but slip-sticks when making minor adjustments. We have to remember that a lot of lens is being moved a long distance when changing focal lengths from 80 to 400mm. Just point the barrel down/up for gravity assistance if you want to zoom more easily. This is rotational zoom though you can use it like a push/pull if you slightly extend the lens (to 90mm) and grasp the outer rim of the lens barrel. Rotation is in the opposite direction of Canon's lenses. Shown fully retracted above are the Canon EF 24-70mm f/2.8 L USM Lens, Canon EF 100-400mm f/4.5-5.6 L IS USM Lens, Sigma 80-400mm f/4.5-5.6 EX DG OS Lens and Sigma 50-500mm F/4-6.3 EX DG HSM Lens. The same lenses (sans 24-70) are shown below at their fully extended lengths. A lens that extends this much moves a lot of air in and out of the lens. Expelled air can be felt at the rear of the lens when quickly zooming from 400mm down to 80mm. It is possible, that over time, dust could be pulled into the lens - especially if you are shooting in dusty environments a lot. Dust can also be blown onto the sensor. I haven't had a dust problem with any of my lenses - and they can be cleaned by factory service if a problem should arise. This attribute is not unique to the Sigma 80-400mm f/4.5-5.6 EX DG OS Lens, but is something to be aware of with long-extending lenses. It looks like HSM (distance window, no push/pull required ...), it has FTM (Full Time Manual) focusing like HSM and it focuses internally, but this is not an implementation of Sigma's top-of-the-line HSM (Hypersonic Motor). Focusing with the Sigma 80-400 OS is audible (but not real loud) and very slow. Focus accuracy and my AF hit rate are somewhat lower than I'd like to see, but not bad. This lens will struggle if action sports are its target. No focus limiting switch is provided. The focus ring is also smooth and well-damped, but has a small amount of play. Attached 77mm filters do not rotate. Shown above fully retracted with included lens hoods installed are the Canon EF 100-400mm f/4.5-5.6 L IS USM Lens, Sigma 80-400mm f/4.5-5.6 EX DG OS Lens and Sigma 50-500mm F/4-6.3 EX DG HSM Lens. The same lenses are shown below at their fully extended lengths. The Sigma 80-400mm f/4.5-5.6 EX DG OS Lens is sharp in the center even wide open over most of the focal length range while center results at 400mm require an extra stop of aperture for good sharpness - f/8 makes a noticeable improvement. Full frame corners like an extra stop of aperture at all focal lengths. Corner results are better at longer distances. Note: the 80mm results in the ISO 12233 chart sample crops were obtained at minimum focus distance - which is not quite close enough to properly frame the chart - thus the results appear slightly smaller. Vignetting results are decent. Full-frame body users will see about 1.5 stops of vignetting in the corners at the wide end and 2 stops in the corners at 400mm. Flare is relatively strong at wide open apertures, but is significantly improved at a one-stop narrower aperture. Distortion is negligible except at close distances where pincushion distortion ranges from minor at 80mm to moderate from 100mm through 400mm. CA (Chromatic Aberration) is very well controlled with some CA visible at the long end of the focal length range. The Sigma 80-400mm f/4.5-5.6 EX DG OS Lens delivers mediocre contrast though colors are decent. Generally accurate exposures with some shot-to-shot variation is my experience. The blur quality delivered by the 9-blade aperture seems to be decent. A 400mm lens and some good subject-to-background distance can create a very diffusely blurred background. As specified in its name, the Sigma 80-400 OS is a variable max aperture lens - like most entries in this zoom focal length range category. Starting at f/4.5 at 80mm, the next change comes quickly - f/5.0 at 88mm and then on to f/5.6 at 199mm. FWIW - This lens delivers two clicks at f/5 near 100mm. Keep this in mind if you are making an aperture change near 100mm. Plan on needing good light to stop action with this lens (or any other with similar specs). The Sigma 80-400mm f/4.5-5.6 EX DG OS Lens has a minimum focus distance of 5.9' (180 cm) for a mediocre MM (maximum magnification) of .2x. Compatibility with the Sigma 1.4x Extender and Sigma 2x Extender makes this lens capable of higher MM values, but with the narrow starting aperture, only Canon's 1-Series bodies will AF with the 1.4x and none will AF with the 2x installed. These extender combinations are not the best. The Sigma 80-400 OS is available in Canon (reviewed), Nikon and Sigma mounts. The standard disclaimer: You should know that there are potential issues with third party lenses. Since Sigma reverse engineers (vs. licenses) manufacturer AF routines, there is always the possibility that a new body might not support an older third party lens. There are examples of this happening in the past. Sometimes a lens can be rechipped to be made compatible, sometimes not. Second, there is the risk of a problem that results in the lens and body manufacturers pointing blame at each other. However, Sigma USA's 4-year warranty is far superior to Canon's standard 1 year warranty (though many credit cards will double the Canon warranty for you). 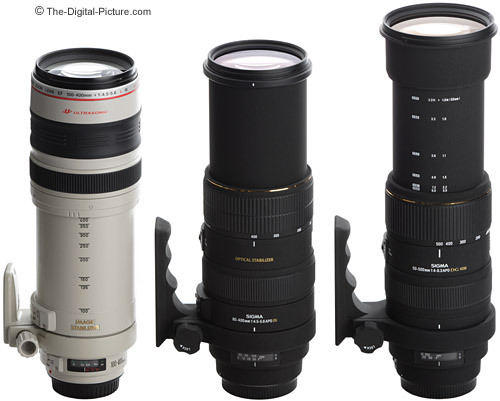 Those interested in the Sigma 80-400mm f/4.5-5.6 EX DG OS Lens are usually considering one of the other two lenses shown in the comparison pictures above - the Canon EF 100-400mm f/4.5-5.6 L IS USM Lens and Sigma 50-500mm F/4-6.3 EX DG HSM Lens - as they share similar focal length ranges and apertures. The biggest advantage the Canon 100-400 has over the Sigma 80-400 is fast, quiet and very accurate USM AF. The Sigma's biggest advantage is a lower price. Other differences include ... The Canon has better contrast and is sharper in the corners (especially at close distances) and is sharper at 400mm. The Canon is 1/3 stop faster at some focal lengths and shows less flare wide open. Both are similar in size, but the Canon is narrower behind the focus ring making it easier to grasp. The 100-400 shows less flare at wide open apertures. The Canon is .6 lb (272g) lighter - a noticeable difference. The Canon's IS implementation is better, but both provide similar handholdability. The Sigma has a wider focal length range. Compared to the Sigma 50-500 ... The 50-500 has an obvious focal length advantage - though 500mm is a bit generous for what it really delivers (more like 450mm?) The 50-500 has Sigma's HSM focusing which provides fast, quiet and more-accurate autofocus. The 80-400 has OS. The 80-400 in general gives me sharper images with slightly better contrast. The 50-500 is 1.1" (27.9mm) longer and .5 lb (250g) heavier. 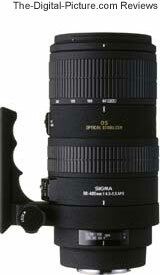 The Sigma 80-400mm f/4.5-5.6 EX DG OS Lens is shipped with a matching-finish lens hood and tripod ring. The removable tripod ring is large and doubles as a handle. A neckstrap attaches to the base of the tripod ring. Rotating the lens in the semi-snug tripod ring is not smooth - loosen it for easier adjustment. Also included in the box is a nice lens case. The case is large but needs the space to accommodate the tripod ring. Match the Sigma 80-400 OS with a general purpose zoom lens for a kit that covers most generally-needed focal lengths. Then stand back and capture your subject(s). People, places, things ... anything that fits in this excellently wide and useful focal length range. The 80-400 is useful for portraits, wildlife, air shows (fast, close jets might be a challenge for the AF though), vacations, walks in the park or at the beach ... For the price, the Sigma 80-400mm f/4.5-5.6 EX DG OS Lens is a good value.